Gurumayi has dedicated the entire month of May as “Baba’s Month.” This is a time for Siddha Yogis and new seekers to remember her Guru, Baba Muktananda, and honor him by celebrating his birthday. It is with great delight that I tell you that this year during Baba’s Month, we’re marking a Golden Anniversary. On May 12, 2019, we will be celebrating the fiftieth anniversary of the day when Baba began to write his spiritual autobiography, Play of Consciousness. In the realm of spiritual writing, Play of Consciousness is unique. It is Baba’s candid and vivid account of the unfolding of his practice of meditation after he received shaktipat initiation from his Guru, Bhagavan Nityananda. Chapter by chapter, we are taken through an amazing journey that culminates in Baba’s attainment of the state of a Siddha. With wisdom and great love, Baba tells how he uncovered the hidden treasures of the inner world. He describes visions and sounds arising within him; he sees the pervasive light of Consciousness; he travels to different subtle worlds in the universe. He comes to understand the true nature of the mind, and he experiences his own Self as the Blue Pearl, the point of pure Consciousness that is the source of all powers of perception and action. Baba draws on scriptural knowledge from the Indian tradition to confirm these revelations as direct experiences of the spiritual power, Kundalini Shakti. In turn, his direct experiences illuminate teachings from the scriptures. Baba said that his book was the inspiration of chitshakti, the power of Consciousness; indeed, Chitshakti Vilas is the Hindi title that he gave to Play of Consciousness. Each word, each sentence carries the power of Baba’s grace, and is filled with his compassion for those longing to have the knowledge of God and to see divinity in the world around them. Half a century after Baba wrote Play of Consciousness, it has been translated into eighteen languages and is read by seekers in all parts of the world. By writing this book, Baba made a monumental contribution to the legacy of Siddha Yoga teachings and practices. Play of Consciousness is available on the Siddha Yoga Bookstore. Swami Shantananda received shaktipat initiation from Baba Muktananda over forty years ago, when Baba gave him the mantra in Gurudev Siddha Peeth in Ganeshpuri, India. In meditation, Swamiji experienced the letters of the mantra dissolving into a vibrant, luminous power that rose up his spine to his head and gently wrapped itself around his mind. He then entered a deep inner space of silence and sweetness, from which he witnessed his quiet mind. Later, he learned from Baba that the Witness is the Supreme Self. He recognized, “This is who I am!” In 1977, he took monastic vows to become a Siddha Yoga Swami. 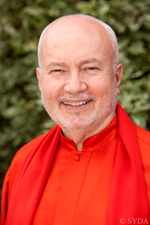 Swami ji serves Gurumayi as a Siddha Yoga meditation teacher, drawing on his own profound experiences in sadhana and his extensive knowledge of the Indian scriptures. Swami Shantananda is the author of the book The Splendor of Recognition, an illuminating commentary on the Pratyabhijña-hrdayam, a key text of the philosophy of Kashmir Shaivism. What I found especially helpful in Baba’s autobiography, Play of Consciousness, is that he not only relates the many amazing sublime experiences of his sadhana, but also candidly shares his experiences of doubt, confusion, and apprehension. The episodes he recounts about turbulent times in his sadhana give me the strength to persevere during my own periods of anxiety and frustration. Baba’s amazing compassion is, for me, a very generous and momentous blessing. Reading about Baba writing Play of Consciousness fifty years ago this May filled me with deep appreciation for the invitation to celebrate this momentous occasion. Play of Consciousness was the first book my husband-to-be read in order to understand the Siddha Yoga path and my connection with it. I was so moved when he couldn’t put the book down and said it connected him deeply to his heart. It was the beginning of my husband’s intentional journey to the Self, which he loved to share with anyone open to listening and which gave him great strength and peace. Every time I read Play of Consciousness, I see aspects of my own personal transformation in a new light. Thank you, dear Baba, for your teachings. And thank you, dear Gurumayi, for the invitation to participate in this golden anniversary—a golden opportunity to dive deeper and deeper into the light of this precious book.